Over time, geology has significantly influenced human behavior; here we provide a very brief overview of the large role geology and topography has played in original settlement of and the cultural and demographic make-up of the eastern U.S. An entire book could be written on how the physical character of the Mid-Atlantic region influenced European occupation and migration; however, an in-depth treatise on European settlement patterns is beyond the scope of this page. Europeans arrived by ship at the eastern seaboard as early as the late 1400s and scattered up and down hundreds of miles of coastline. Perhaps part of human expansion and exploration became possible at this point in history because geologic conditions favored shoreline development, which created navigable ports and harbors. In Virginia, most of the eastern seaboard (Coastal Plain Province) was settled by the British who established farms and plantations in the rich soils on the flat topography of the Coastal Plain. The abundant estuaries made good inland waterways for transportation, and made the shipment of materials in and out relatively easy. The early settlers that wished to migrate inland met a formidable barrier, halting the westward expansion of the British colonies. This barrier was the Appalachian Mountain chain. The collision of the continents hundreds of millions of years ago that formed these mountains actually set the stage for patterns of human settlement, travel and transportation routes in the region (Clark, 2001). The structural framework of the Appalachian region consists of folds and faults with northeast-southwest trends and this framework controls the valleys and ridges of the area today. These ridges and valleys formed both the main routes and major impasses for European migration (Clark, 2001). The multiple ridges, heavy forests and dense undergrowth constrained settlers to the coastal region. The Hudson and Mohawk valleys and the Cumberland Gap proved to be the only viable entrances into the interior of the region. 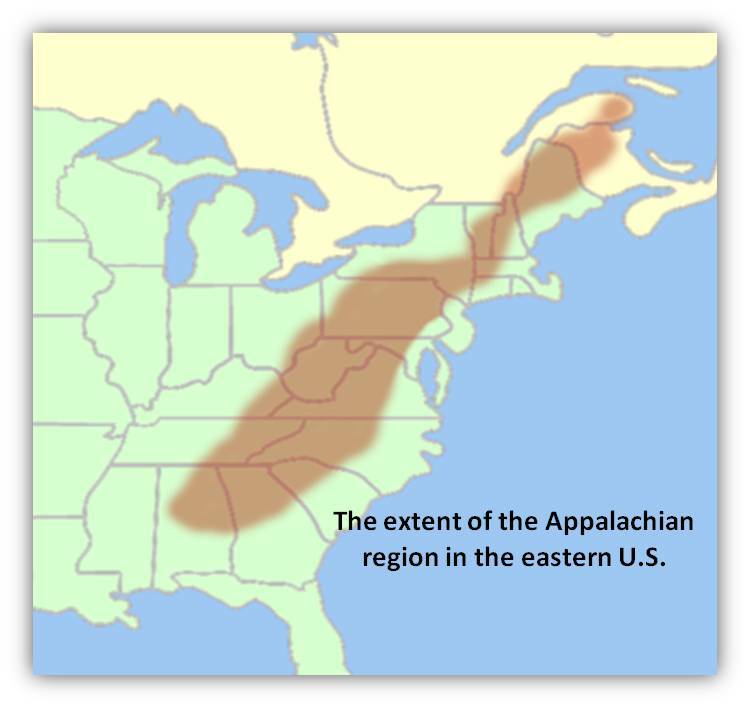 The Appalachian Mountains themselves formed the division between Britain’s colonies along the coast and the French areas in the Mississippi basin. Had the mountain chain not been there, occupation and settlement of the British army along the coast would not have been as concentrated and the French and Indian War may have had a completely different outcome. Population pressures led the European settlers into the Piedmont of Virginia shortly before 1700 (Trimble, 1974). Occupation of the eastern/Mid-Atlantic region of the U.S. continued in a southwestward trend until the 1830s (see figure to left). Immigrants from Great Britain tended to head for New England, Virginia and south. The Dutch populated much of New York and the surrounding areas, and large numbers of Germans landed in Philadelphia and quickly headed inland to southeastern Pennsylvania. These broad valleys of the Shenandoah and the Great Valley of Maryland, traversed by long, linear, largely navigable rivers (at least in high water) and underlain by carbonate rocks that also make excellent soils, were a natural highway, with few significant barriers. Here the Germans and Dutch settled in the Lancaster area of Pennsylvania. The Scotch-Irish settlers were able to pass over the Appalachians with greater ease and they spread not only up and down the Blue Ridge Mountains, but also into the rugged valley and ridge mountains to the far west. In time, the locations of population centers were based on availability of raw materials and transportation routes. As a result of the continental collision that formed the Appalachians, rocks that had formed in diverse physical environments were juxtaposed.This resulted in a diverse landscape and also determined the habitat and life forms that exist in the Appalachians. Underlying rocks helped to determine the patterns of regional development as some rock was better for farming, some for mining and some for timber. The bedrock of the Valley and Ridge province consist of the interlayered and interfingering sand, clay and limey ooze that was first deposited on the floor of a shallow inland sea. Later, more resistant sandstone was deposited on top of that. The limestone erodes more easily than resistant sandstone, so it formed the valley and, because limestone provides a natural fertilizer for crops, the valleys became centers of agriculture. Lava and sediment that were deposited to the east produce soils that are favorable for timber and farming in the narrow valleys. Specialized bird and other ecoysystems are born out of this area ruled by rocky summits and granite intrusions. Oak forests are also common in volcanic soils. The Grenville Basement Rocks of the Blue Ridge province have proved to be as bad as the Piedmont basement rocks for the formation of richer soils, but scattered here and there are exposures of Mafic Igneous Rocks, and these weather into excellent soils. In fact the best soils have developed over the Cambrian Catoctin lava flows as well as the Triassic intrusives in the rift graben of the Atlantic opening. As settlement continued into the mid 1800s, gold mining began to boom in the mid-Atlantic region. Gold is found in certain areas along faults in the region; these faults once acted as conduits for migration of fluids and allowed concentration of precious metals. The discovery of gold was probably the largest driver of human settlement patterns at that time, and thousands of settlers and new European arrivals descended upon the region. Gravel was washed from streams and banks, creating severe erosive conditions in the once-stable streams and tributaries. The Cherokee Indian tribes that lived in the area were quickly displaced and were forced to march westward to Oklahoma during the winter of 1837-1838. The path along which they were forced to leave was later called the Trail of Tears, and over a third of the people did not survive the forced migration (Clark, 2001). While the topography, geology and terrain significantly impacted early settlement patterns and way of life, the newcomers in turn had a substantial impact on the topography and terrain of the area. 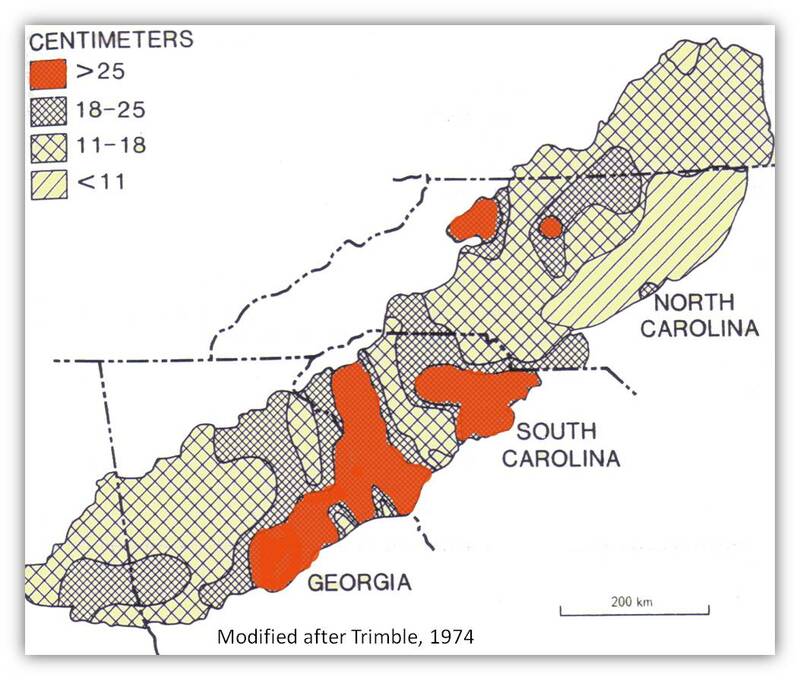 The Piedmont region of the Appalachians -- a plateau extending from New Jersey to central Alabama -- characterized by low rolling hills and well-defined highly dissected drainage systems -- was heavily settled becoming one of the most severely eroded areas in the U.S. due to widespread deforestation and cultivation of the land by European settlers. 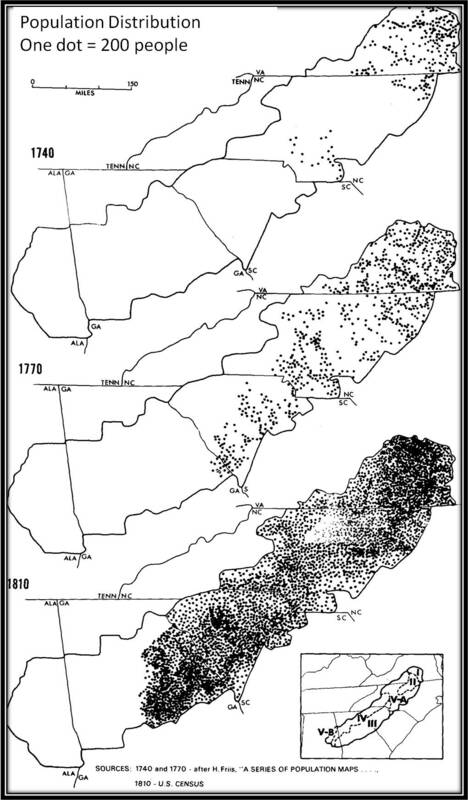 See below a before and after figure of existing virgin forest in the year 1620 (William B. Greeley, The Relation of Geography to Timber Supply, Economic Geography, 1925, vol. 1, p. 1-11 ) versus 1920 (George Draffan, The Big Outside: A Descriptive Inventory of the Big Wilderness Areas of the United States, by Dave Foreman and Howie Wolke (Harmony Books, 1992). Sediment that was eroded from upland areas after the arrival of early colonial settlers and during centuries of intensive land use was deposited in valley bottoms along stream corridors, burying pre-settlement streams, floodplains, wetlands, and valley bottoms. The abundance of sediment altered and continues to impair the hydrologic, biologic, aquatic, riparian, and water quality functions of pre-settlement and modern environments in the Piedmont region. Prior to European settlement, erosion was minimal and streams ran clear, according to historical documents. Some aboriginal erosion occurred in the form of burning and livestock movement/grazing; however, this was considered insignificant when compared to European clearance and land-use practices. Oscar Leiber, the state geologist for South Carolina in 1856, documented that “…rivers which were clear and limpid, when first discovered, are now turbid and muddy..”. Sir Charles Lyell (1845) noted that “…that tributary sent down a copious supply of red mud, while the other (the Ocmulgee) remained clear, though swollen. But no sooner had the Indians been driven out, and the woods of their hunting ground begun to give way before the ax of the new settler, than the Ocmulgee also became turbid." The point of this brief history is to establish that human history does not take place in an environmental vacuum. In innumerable ways, including the large scale migratory patterns, or why two farms next to each other fare so differently, geology dominates and controls where and how we live and what we can do to exploit our location to the best. The evidence of geology's influence exists everywhere, and current day evidence is found in regional and local accents, cultures, architectural styles, surnames, etc. We need not understand all the ways geology influences us, past and present, but be aware that it does. Clark, S., 2001. Birth of the mountains: the geologic story of the southern Appalachian Mountains. USGS unnumbered series, 23pp (http://pubs.usgs.gov/gip/birth/birth.pdf).